Back in April of 2007, I posted a daytime photo from this very location. 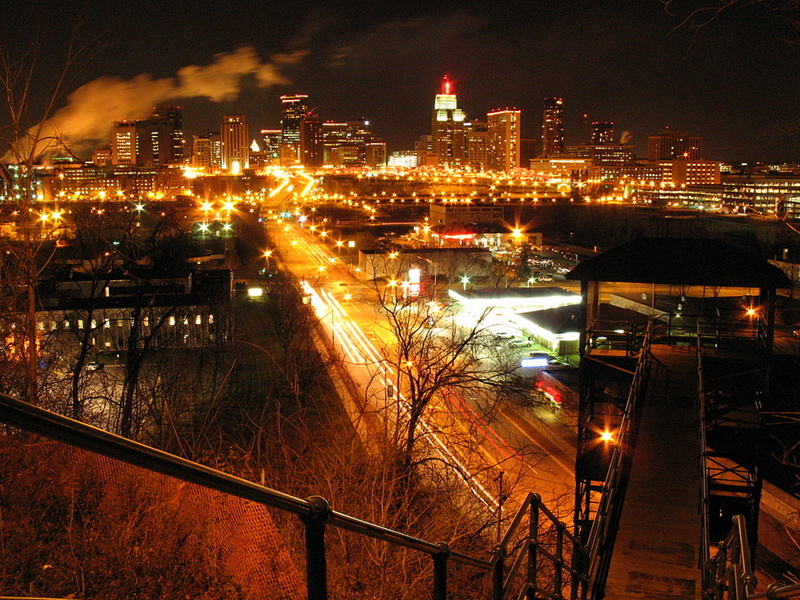 I never thought it would make for a night time location to take a photo from. After looking at the results, I'm more than pleased with the results. 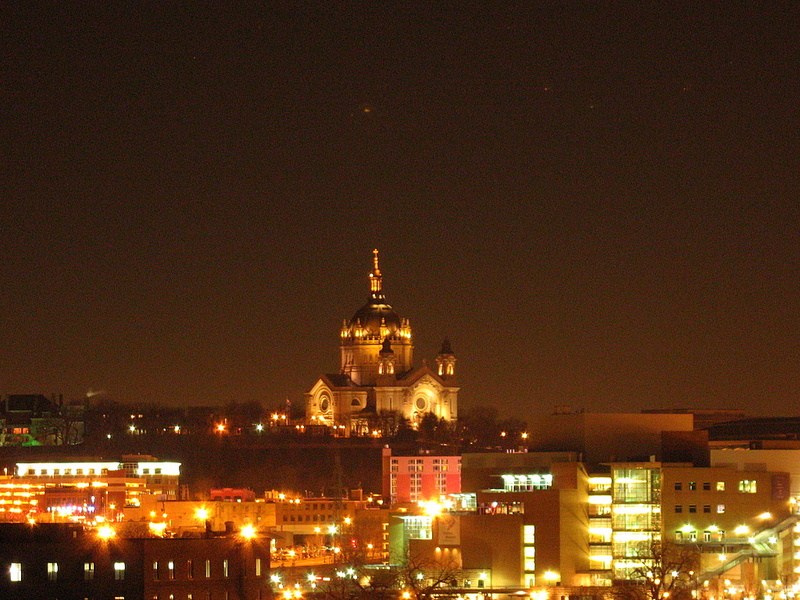 The downtown you are looking at is St Paul. Not sure if you can make it out, but if you follow the street, across the bridge, you'll see a small white pointed dome, that is our State Capital Building. 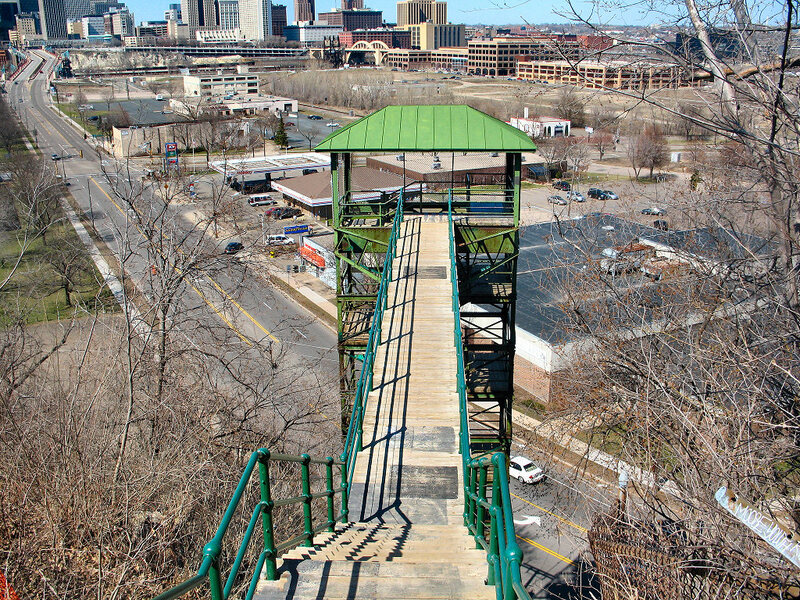 These green stairs are on the bluff of the West Side neighborhood. 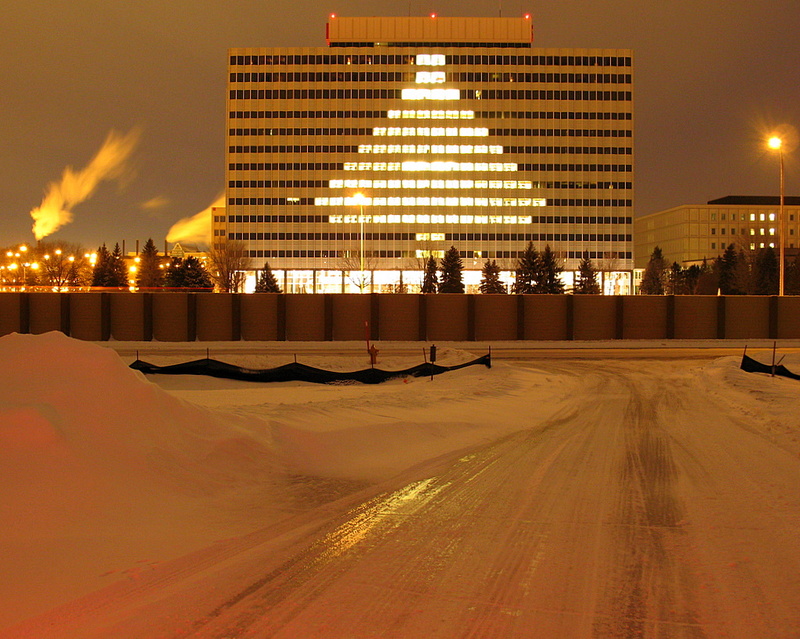 I didn't take too many Christmas themed photos this year. I was rather busy this last month of 2007. I do have one final Christmas photo to post. When we were putting lights on the Christmas tree, my cat named Ruby, felt he could use the heat of the lights to warm himself. I had plugged the lights into the socket to test them out, set them on the floor and left the room for about a minute. When I returned, the lights had a new occupancy. 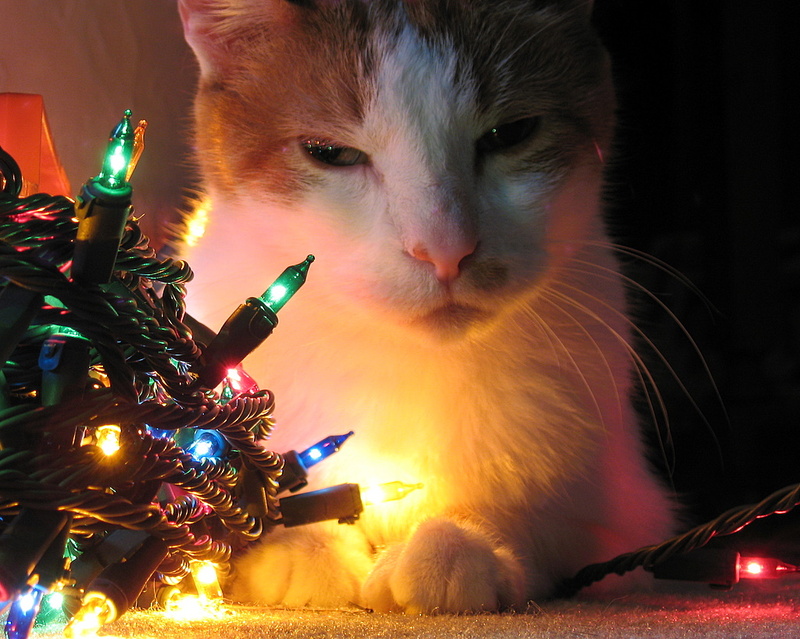 I even had move the cat off of the lights, but he insisted on using the lights to keep warm. I did see it as a goof photo opportunity, grabbed the camera and here is the result. Two days left until we close the year 2007. Scary eh? 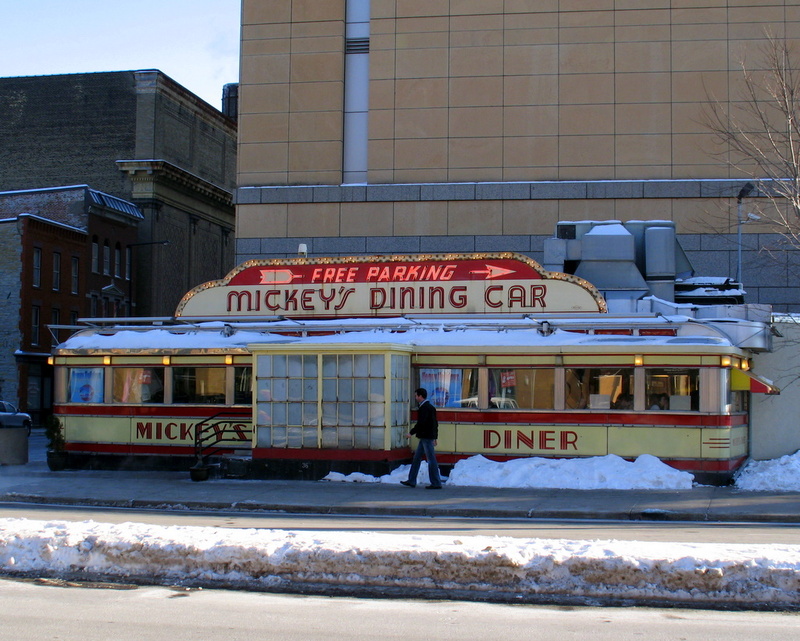 The world famous, Mickey's Diner in downtown St Paul. 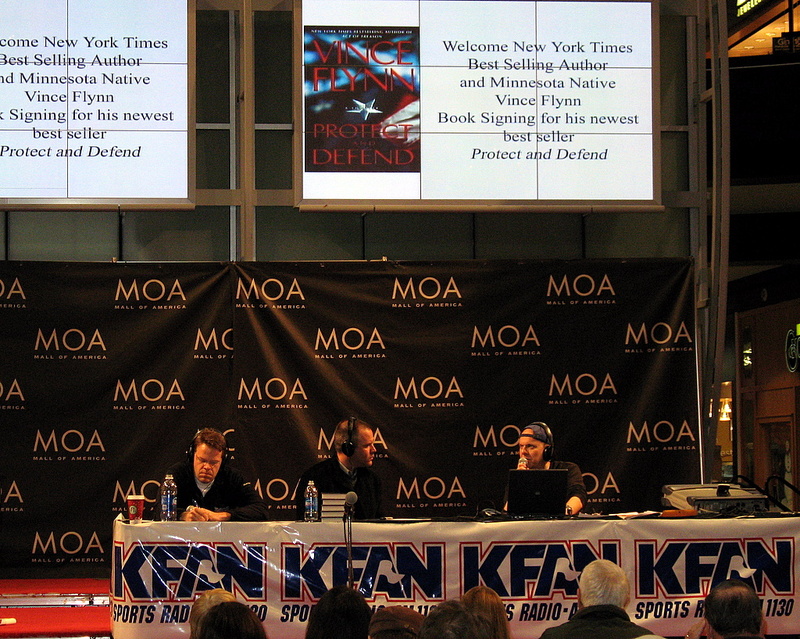 Born in St Paul, Minnesota, best selling author, Vince Flynn was at the Mall Of America to promote his new book 'Protect And Defend'. 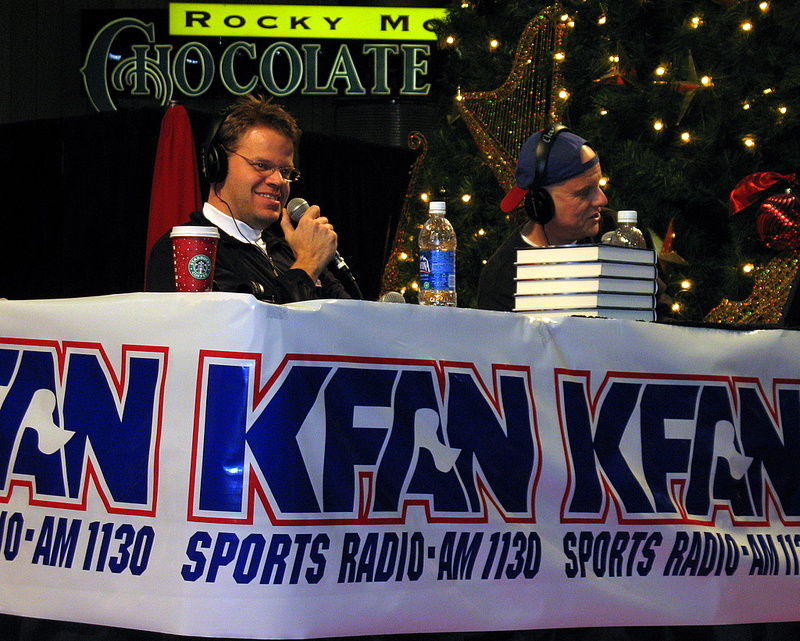 He first was interviewed on KFAN at the Mall Of America rotunda during the Dan Barreiro show that was there for the book signing. Once his radio interview was over, he then signed books to everyone in line starting at 6:30. 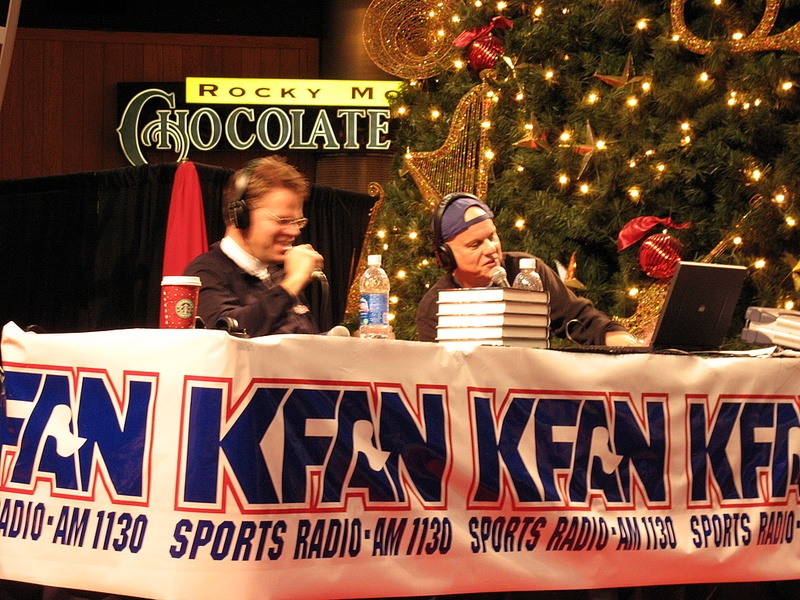 When the radio show ended, I left the area and did some Christmas shopping as this event happened mid December. I passed by the area a few more times to see if Vince Flynn was still there signing books, sure enough he was. When I left, the line was snaked around a few times and then it shot down the hallway as far as I could see. Come 9:30, I pass by the area once again and I watched the last person in line get their book personally signed. I was amazed, he signed a book for everyone. Plus, there was a stack of about 50 books that were to be signed and sold at the local book store. I'm really kicking myself for not getting a book signed by Vince. Here I am praising him for the time he put in for the book signing, as the event was scheduled for 6:30 to 8:00, yet he stayed double the amount of time. I was impressed by this and applaud him for doing so. I must have walked by five different times and said to myself to get in line and get a book signed, but I did not. 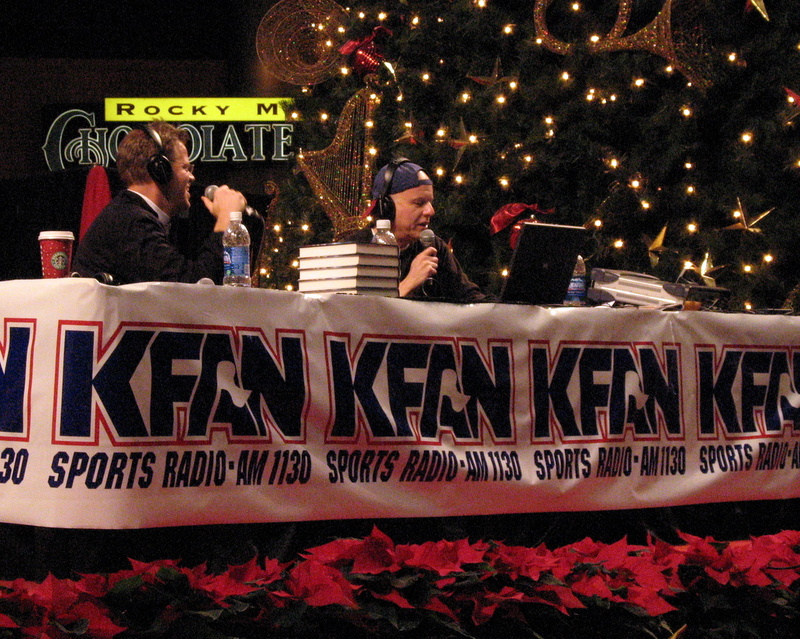 In all honesty, I've heard him being interviewed quite a few times on KFAN, but I've never read any of his books, yet. He has gotten himself a new fan, I will get the book at some point and read my first Vince Flynn book. Vince Flynn is in the center of the three people in the photo, Dan Barreiro is on the right wearing the hat, and his sidekick during the show named 'Fun' is to the left. More of the large bulbs that are hanging in the air at the Mall Of America. I really liked this one because of the squares of grass in the shot with the color red. Yesterday I heard the term "Christmas Eve Eve" said on the radio. I had never heard this term before and just find it kind of odd. I understand why it was said, but in all honesty, shouldn't we really refer it simply as December 23? 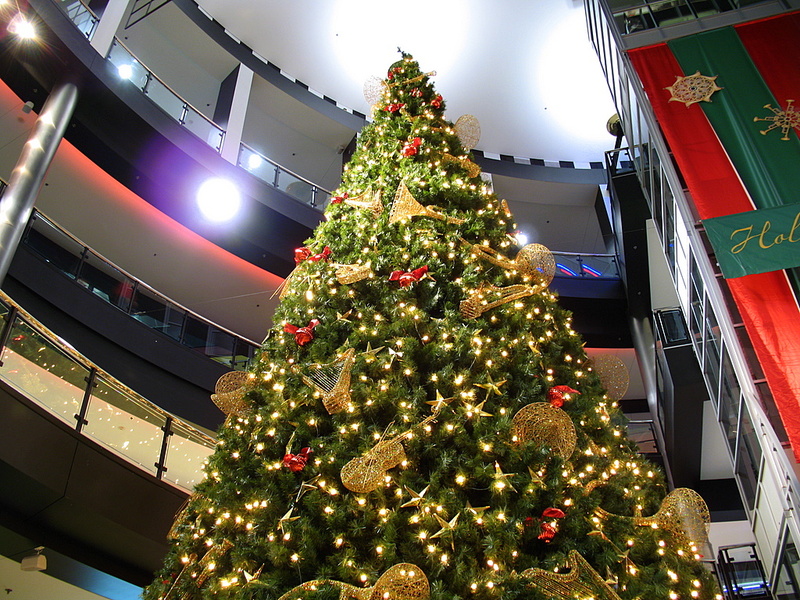 This tree is on display at the Mall Of America in the circle rotunda. It tops three stories high in it's height. The rotunda area has a fourth level of restaurants [which are currently closed and have been for about a year]. 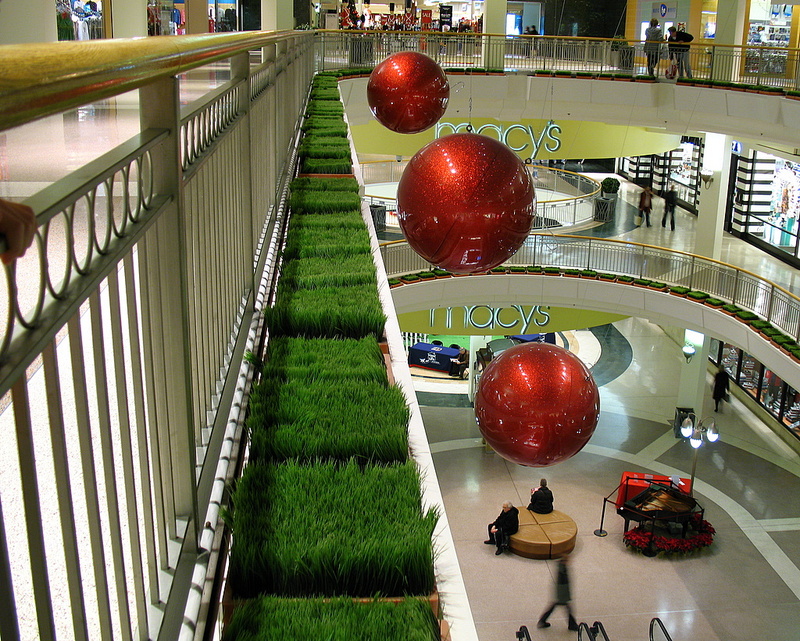 Classic Brass Inc performed at the Mall Of America on December 12. 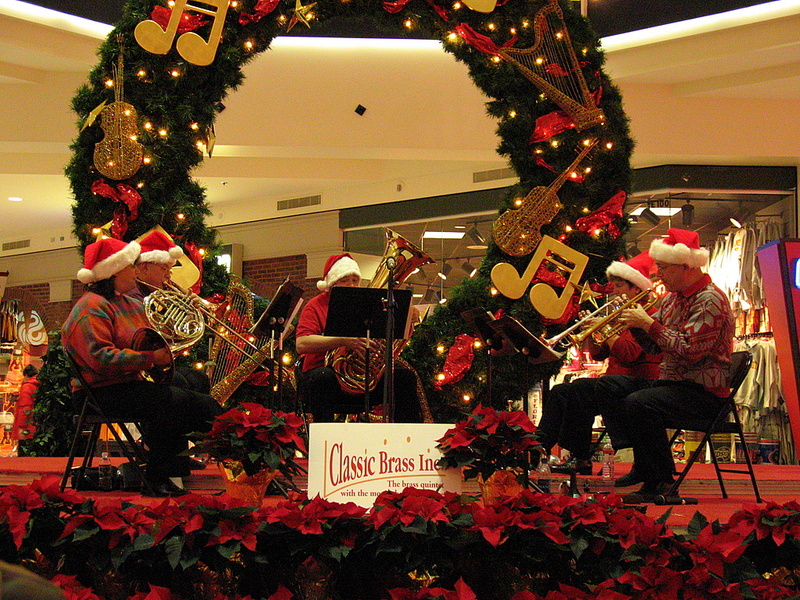 They are a quintet of various brass instruments and played traditional Christmas melodies that evening. I've always enjoyed this kind of music since I was very young when I would see some of the members of Classic Brass Inc perform in the Minnesota Brass Drum and Beauty Corps. If you are able to see CBI perform someday, put in a request for the song "The Saints’ Hallelujah". I've heard them play it twice now and it's become one of my favorites. It's a great mix of two songs you're familiar with, a jazzy Saints Go Marching crossed with a traditional choir sound of Hallelujah. 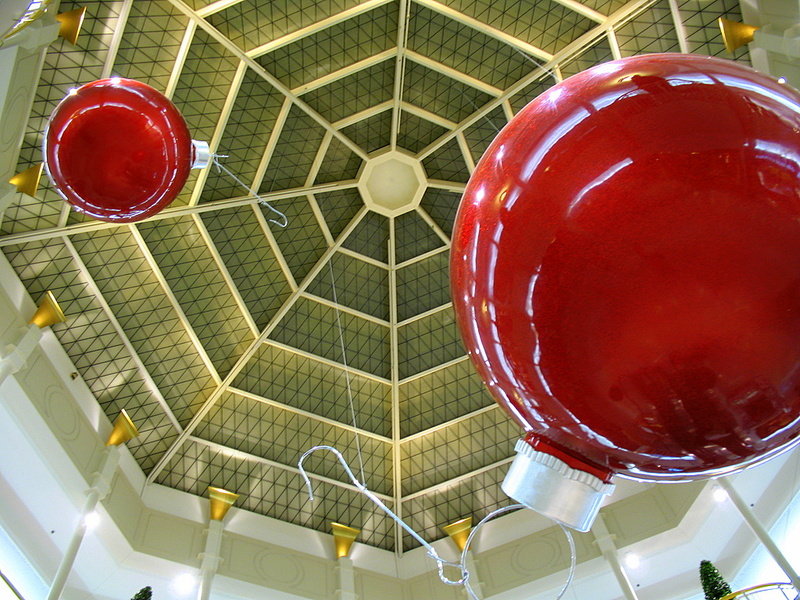 These larger than life Christmas bulbs are hanging in the air at the Mall Of America in Bloomington. There are many more of them on display at various locations through out the mall. With the pattern of the ceiling, this location was my favorite in the large shopping complex. 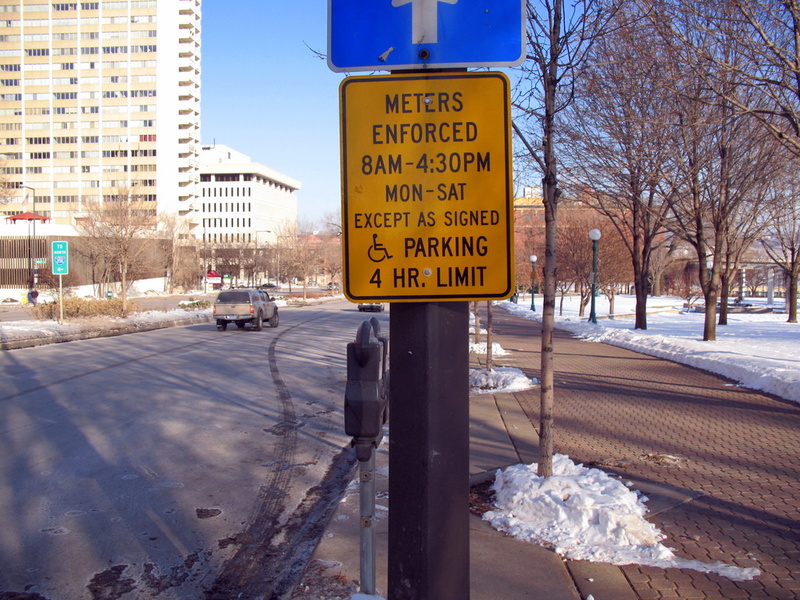 I've always gotten a laugh out of the meter parking enforcement laws in St Paul. 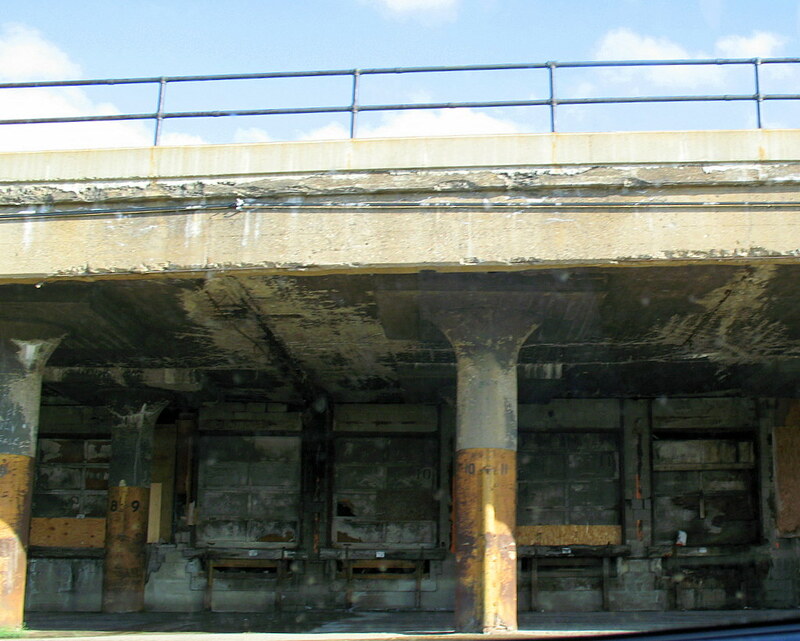 I took this photo along Kellogg Avenue in downtown. My car was the only vehicle that was parked along side the road on a Saturday afternoon. Do they really enforce the metered parking on a street that doesn't need to be enforced on a Saturday? 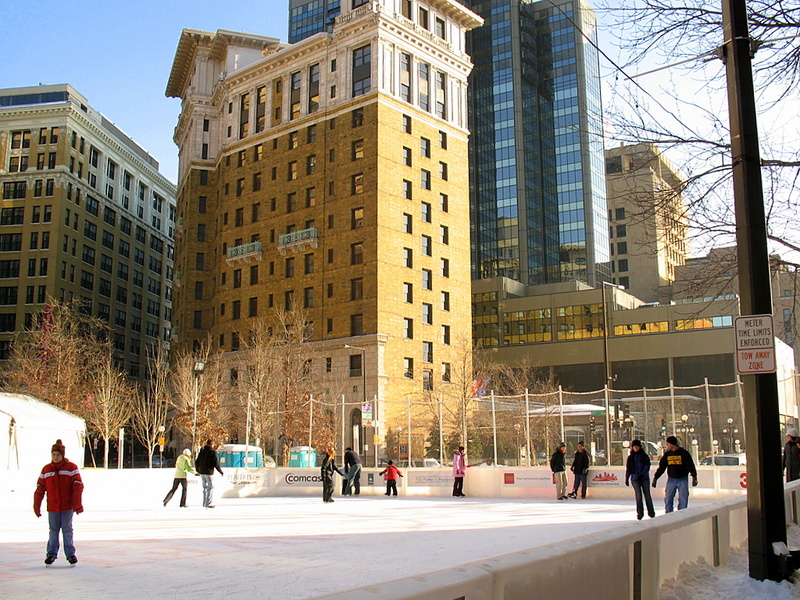 They turned part of the road in downtown St Paul into a skating rink. I was very surprised to see this when I took a walk downtown over the weekend. To my right is Land Mark Center. The brick building in straight ahead is The St Paul Hotel, straight down the sidewalk you would run into Rice Park and then the library to give the locals an idea where this is if you haven't seen it. 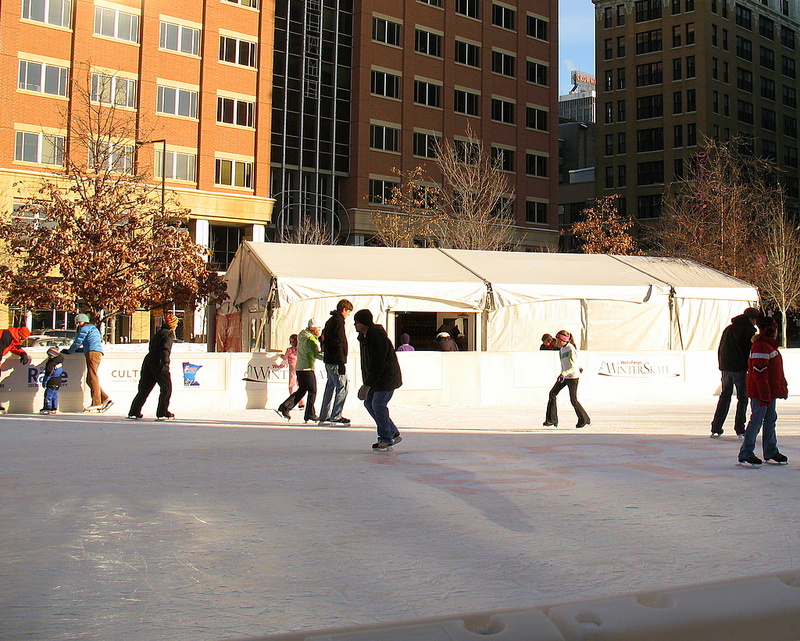 It was a bit chaotic watch everyone skate. 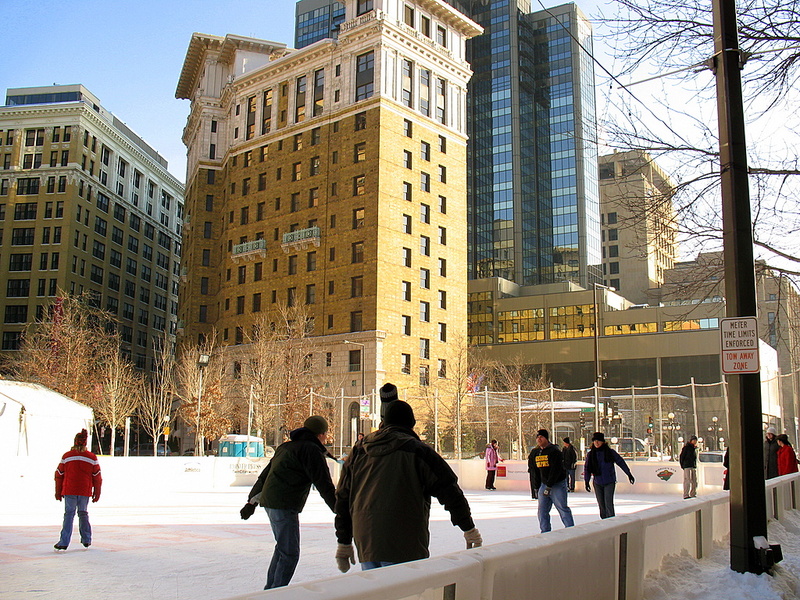 There were couples skating in opposite directions, people spinning in circles, people standing still just talking, and a couple kids chasing each other. I was waiting around waiting for people to crash into each other, but it never happened while I was there. 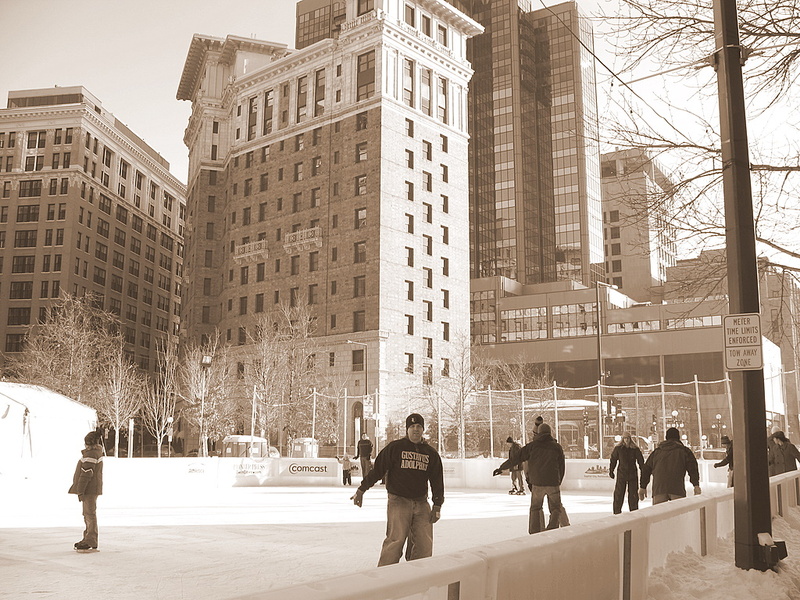 If you're going to be nearby, throw your skates in the car. About a two weeks after I took yesterday's photo, this photo was taken. 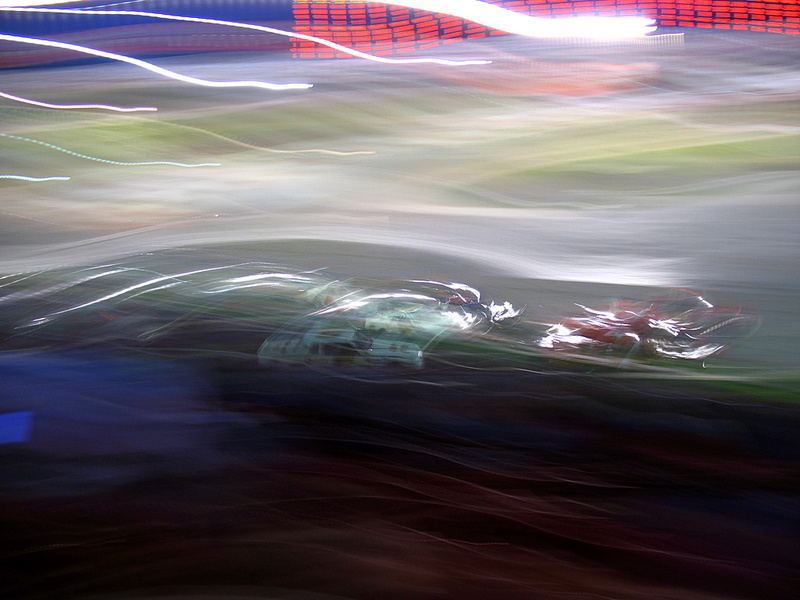 It was the end of the number 31 car as it took a serious crash into the wall on turn number 3. 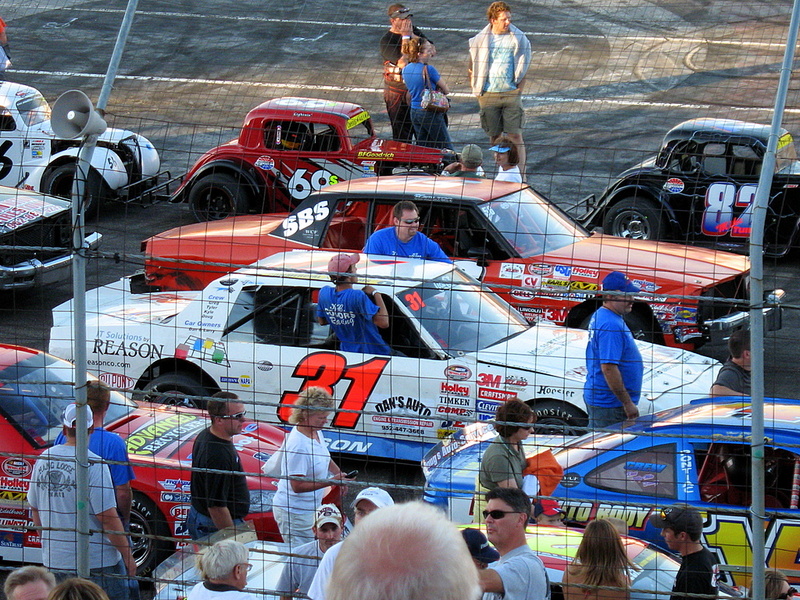 This car was never to race again as the damage it received was to great to overcome. They suspect it was a deliberate push into the wall by one of the point leaders, but it went over looked by the officials. That's just the way it is in racing. The absolute bummer about this situation was, they were in need of a new motor for car 31. The week before it's final race, they replaced the motor finally. 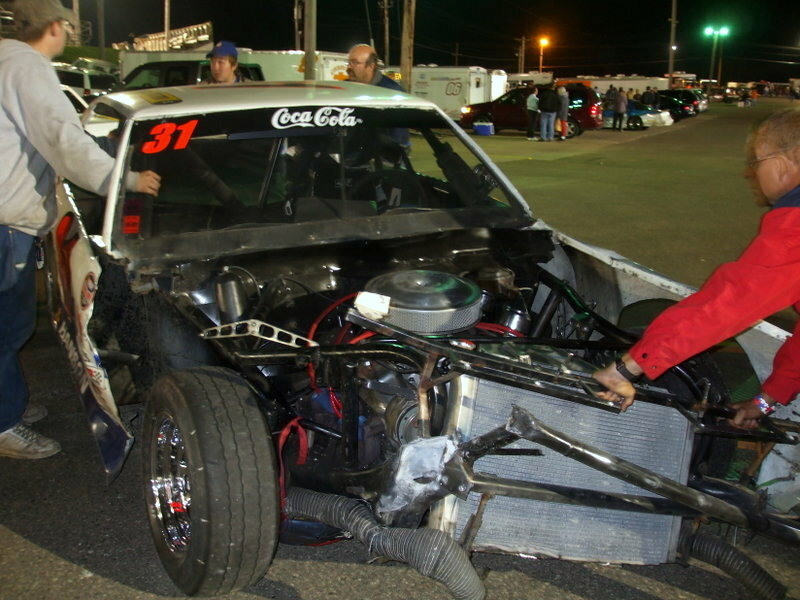 After a very expensive engine change, it too was destroyed leaving Turn-Key Racing without an engine and a car frame. 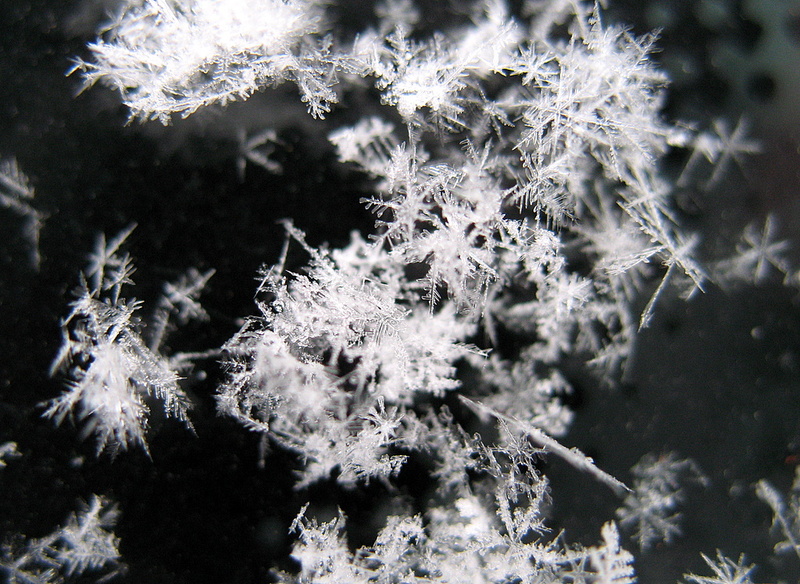 Our next theme day on January 1 will feature our "Photo of the year" from our 2007 postings. While I have not posted today's photo yet this year [until now], it is one of my personal favorites I've taken. 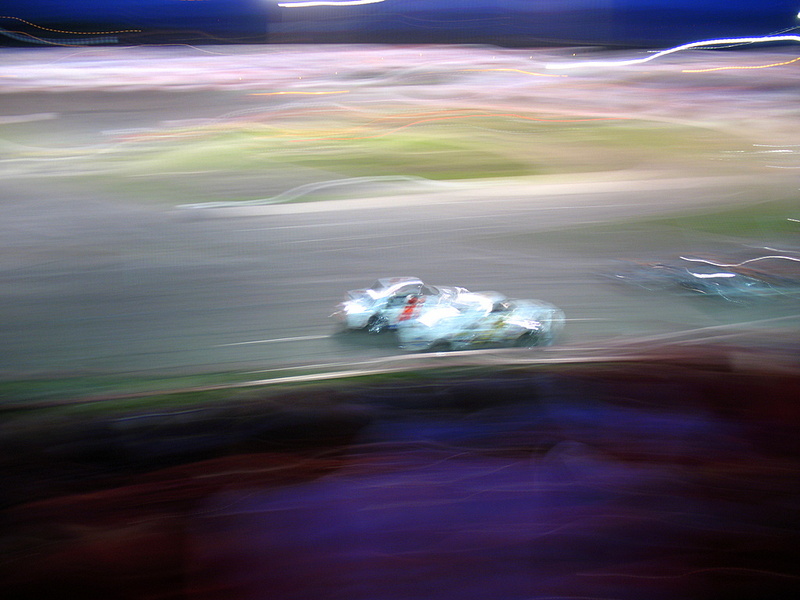 Mainly because it was a very difficult shot to get, but it will not be my choice for photo of the year. There were many failed attempts to get this one shot. I had to try many different settings, learn how to pan and shot from where I was sitting without a tripod. I took about 20 shots on the night to get this one. 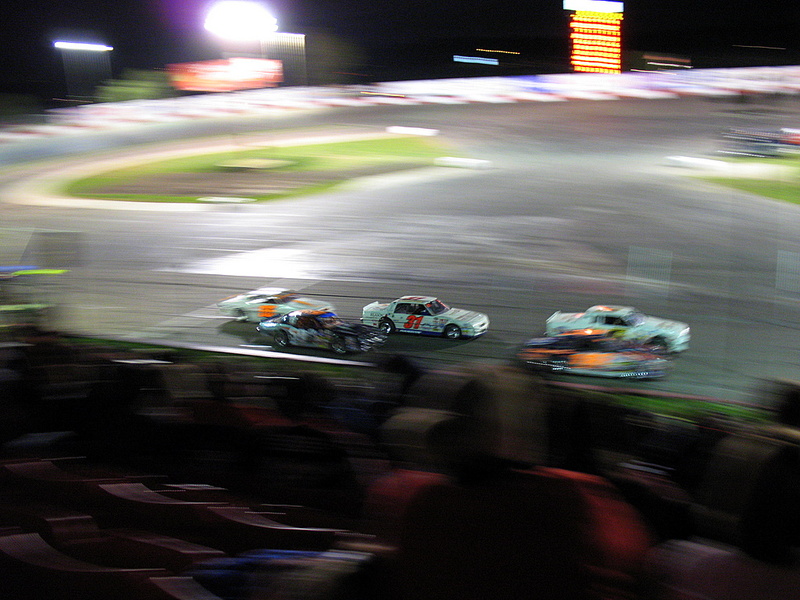 It was also my second night at the races of shooting photos. I did learn, the shorter the exposure, the less chance of unwanted movement in the photo. My settings for this one ended up at f/2.8 and a shutter speed of 1/6 seconds. Kind of strange eh, an icicle growing out of a rock? I spotted this in Hastings along the Vermillion Falls. 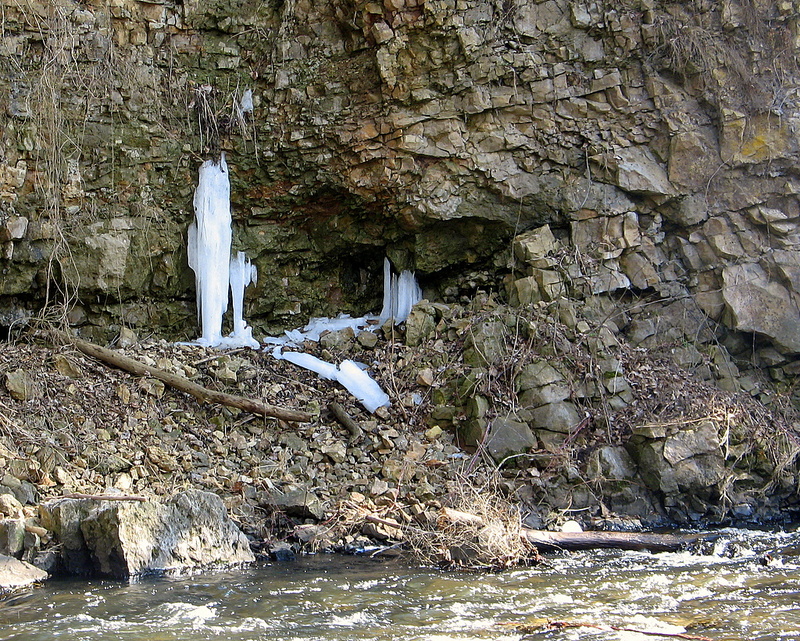 It must have been gravity and some dripping water down the side of the cliff that formed this strange piece of ice. What's your guess on the use of this building: Is it used for office space or has it been converted to apartments? 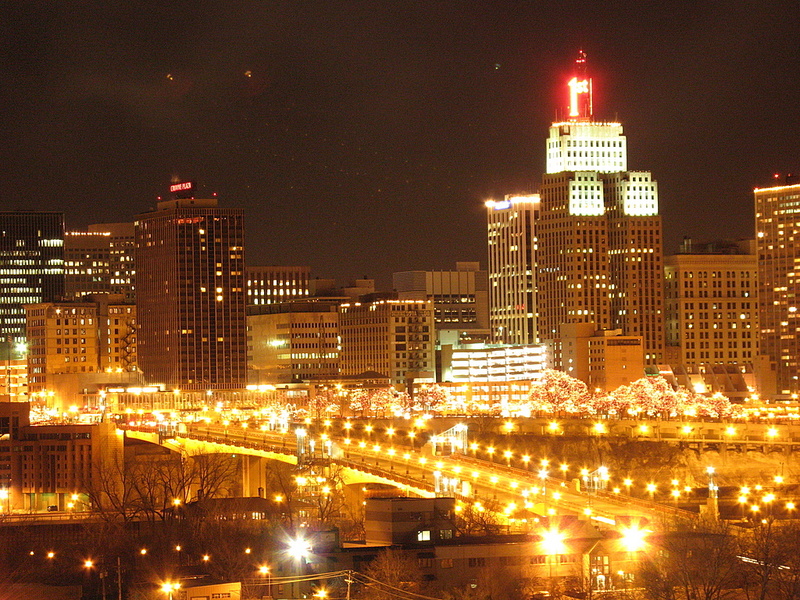 The building location is downtown Minneapolis, but I don't know the function of the building. I really liked the front entrance and the brick pattern on the top of the building. Plus I just noticed that I've captured the reflection of a school bus in some of the windows. 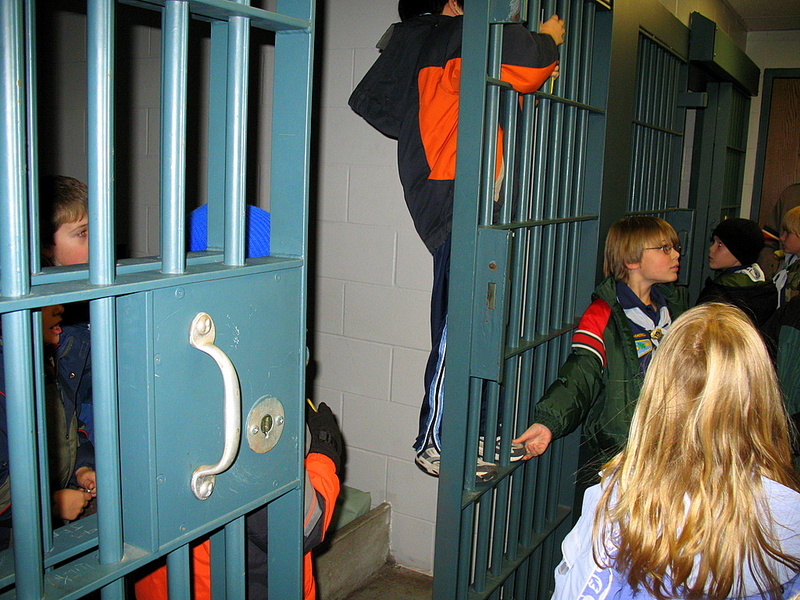 If you stopped by yesterday and saw the photo of the steel bars across the jail cell, here is why I was there. My son's Cub Scout den was there for a tour of the Police Department as one of the activities needed for a badge they were working on. 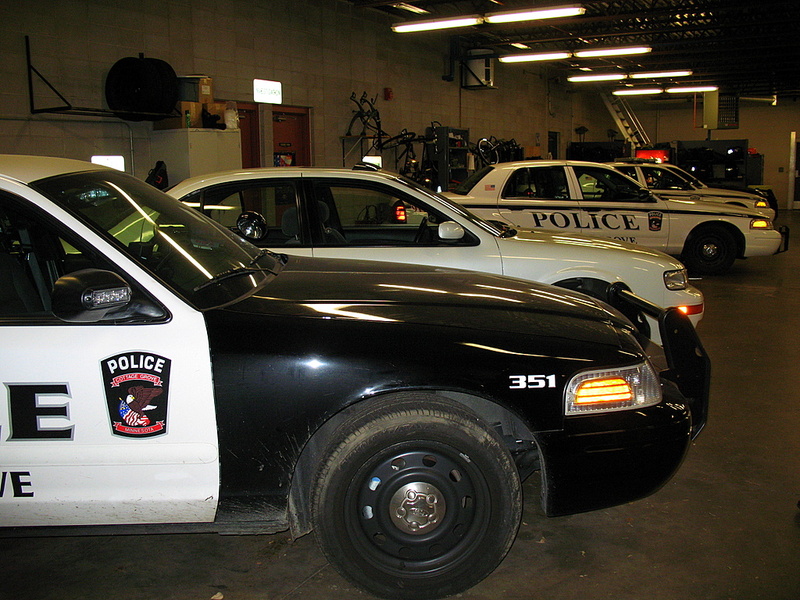 Being as Cottage Grove is a very small city, the size of the police department is very small. They have two holding cells, but that's really all they are for. They hold the criminal until they process them and then they take them to the county jail or to the prison in Stillwater. 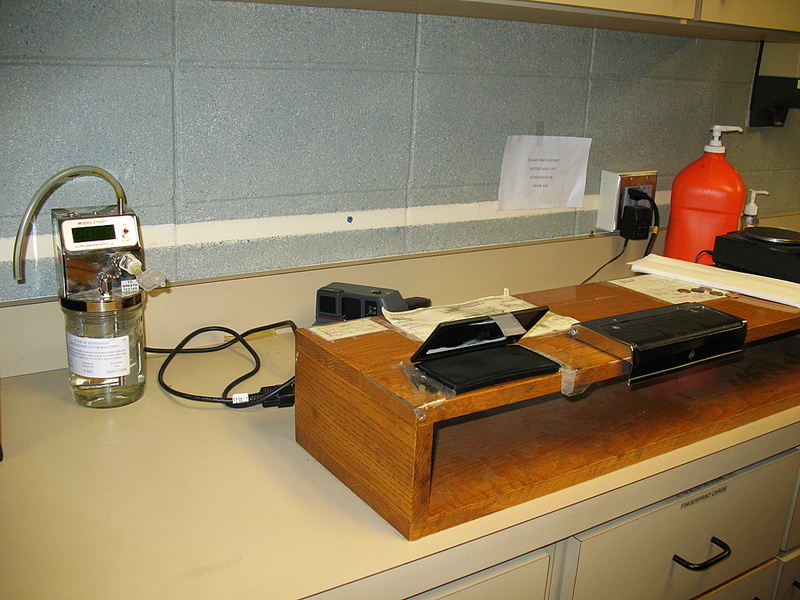 There is a small lab for DUI and narcotic testing. One of the photos below shows a scale and a breathalyser for intoxication levels. 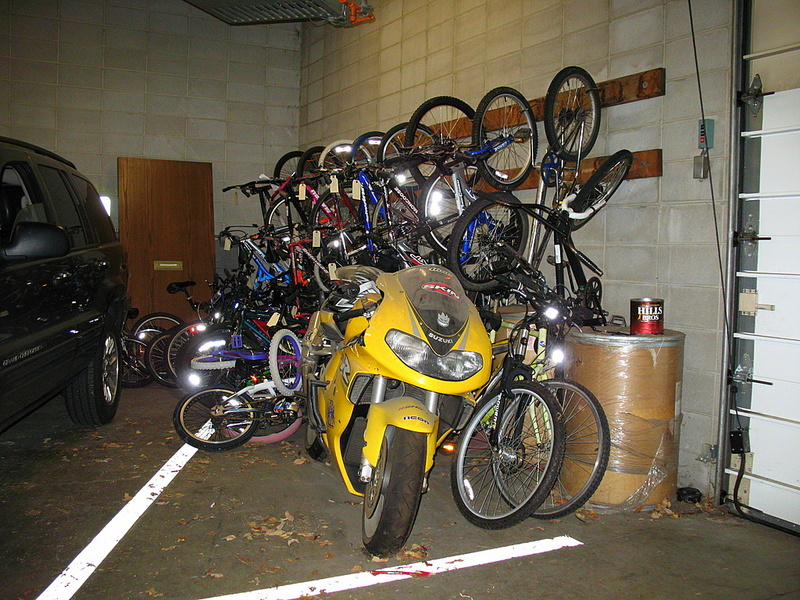 The photo that has all of the bicycles in it, those are stolen bikes that were found and do not have a serial number ID on it. When they collect enough of them, they bring them to the county auction for selling. 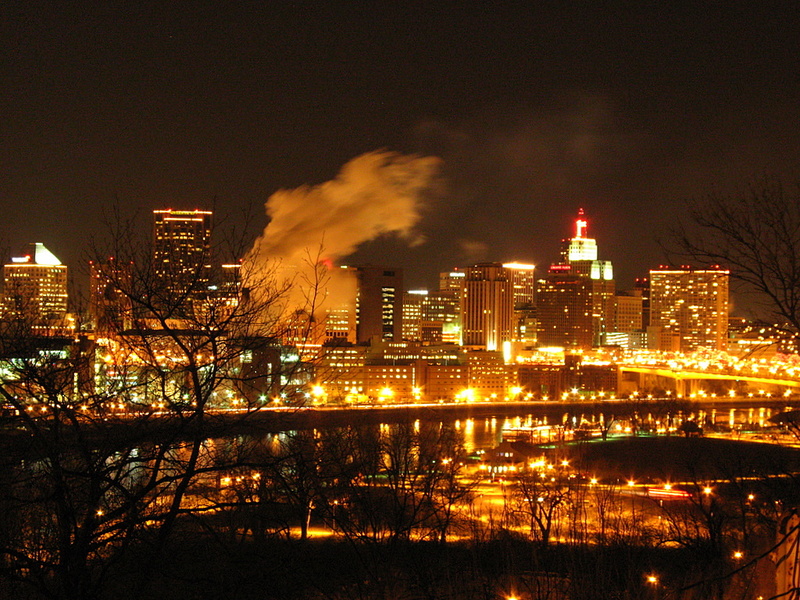 Minneapolis, Minnesota - Chris's final post. You will be missed, but not forgotten. I made a visit to the Cottage Grove police department last week and was able to take this photos before I entered into the holding center behind bars. 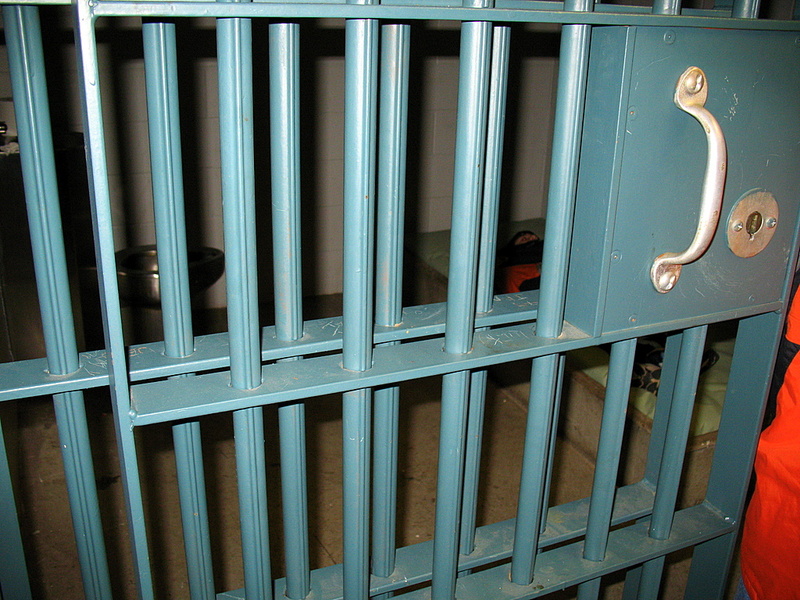 Yes, these are the cold steel bars of the jail cell and I did not scratch my initials into the green paint. The room dimension of the cell was about 7 foot by 8 foot. There was a stainless steel toilet and a mattress on a frame of concrete in the cell. Not your typical comfort of home. I'm not sure if you can make it out, but look closely at the photo and you'll see the building I featured in yesterday's daily photo. It's there in the open field, near the almost frozen Mississippi River. 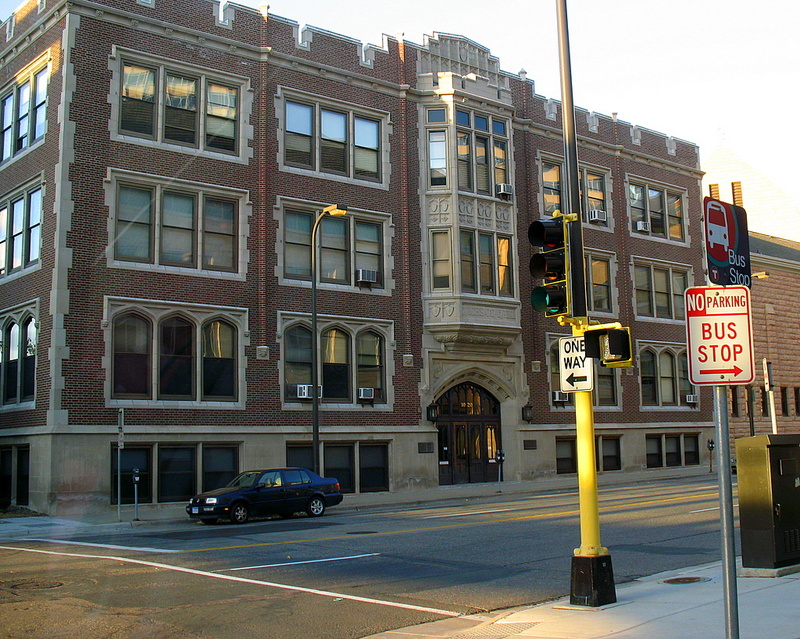 A close up of the main building on Harriot Island, a stones throw from downtown St Paul. 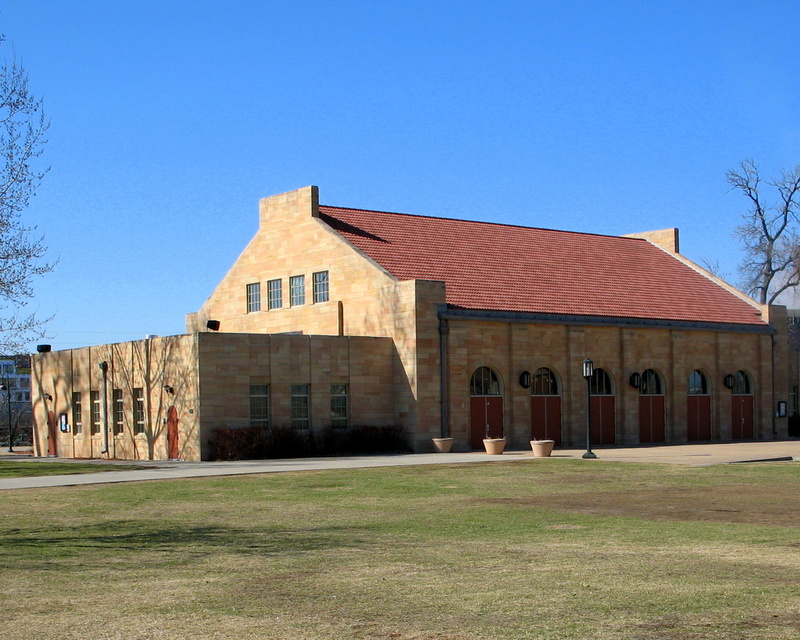 I've posted a photo of this building in the past, but it was from the other side of the Mississippi River. Today's photo is from with in the Harriot Island park and the Mississippi River is completely on the other side of the building. 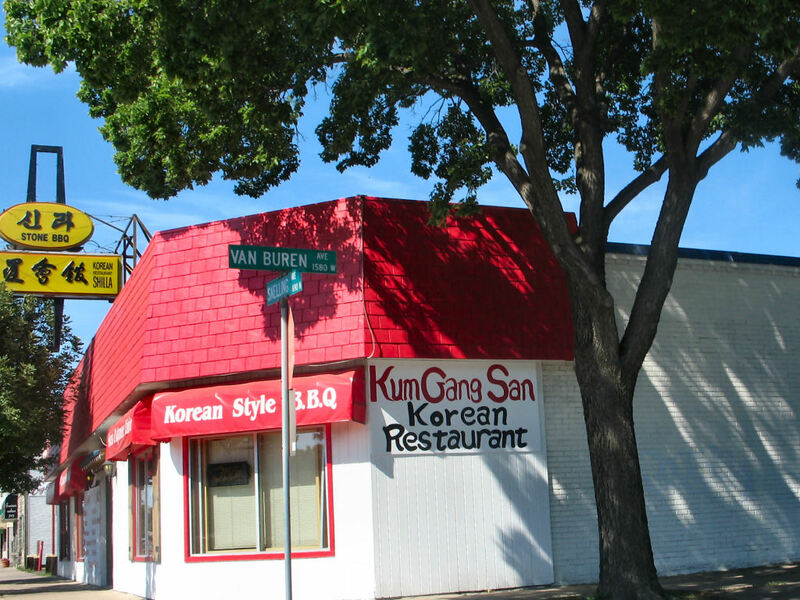 I've seen funny foreign restaurant names posted around the internet before that were suggestive or a close to a dirty word, but never did I ever expect to see one around the Twin Cities. I hope some of you find the humor in the photo as I did when taking it. 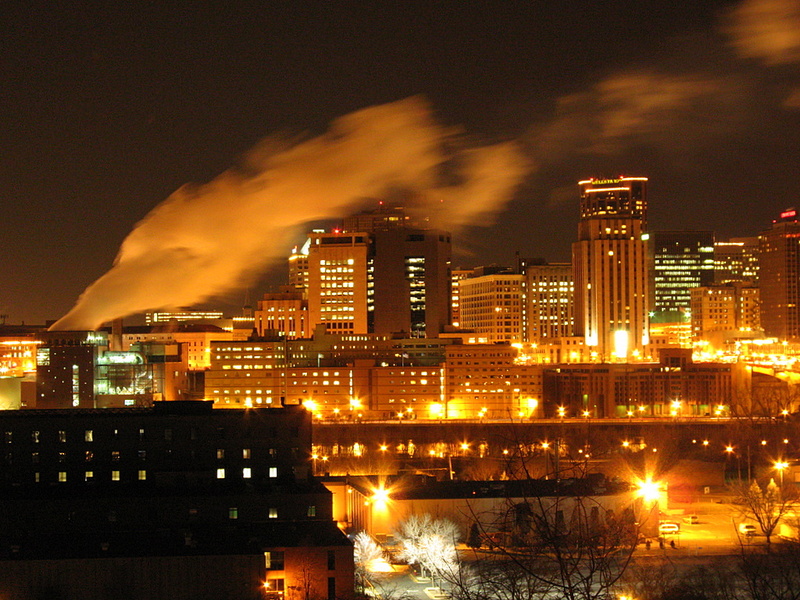 One of the Minnesota State Capital Building in St Paul from a good distance away. The river at the bottom is the Mississippi River with the newly built Mississippi Flats built along side the river bank. I was reading the comments left by Fenix of Boston Daily Photo and had to laugh. He said yesterdays photo looks like the whole city was on fire. Throw in the smoke, I understand exactly what he is talking about. Today's photo is no different. It's from the same location as yesterdays and was actually my intended bridge that I was going to post a photo of. 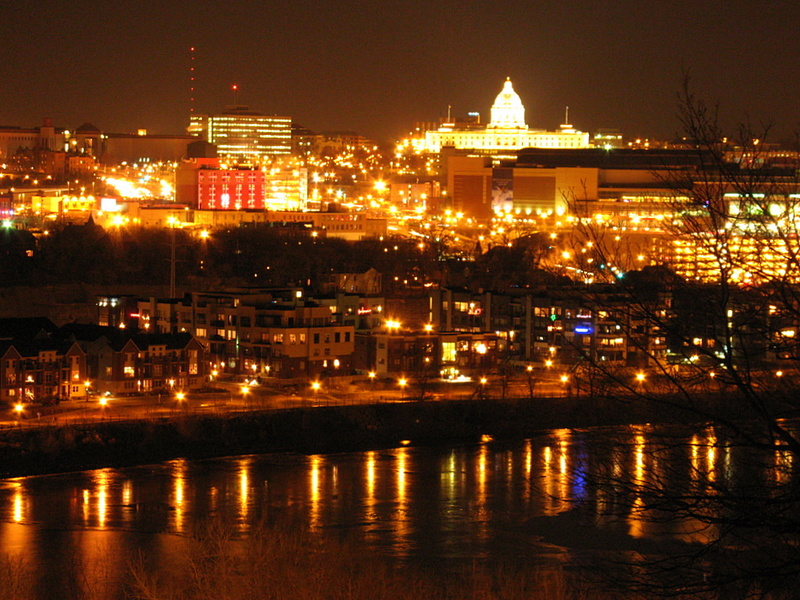 My intent was to take a photo of the Wabasha Street Bridge, from the High Bridge looking over the Mississippi River and getting a great reflection from the bridge lights. Well, the river was partly frozen and I thought I was dressed warm enough, but I was not and had to leave the High Bridge sooner than I wanted to because of the winds blowing across the bridge. As I left the High Bridge, I took a quick photo of the bridge I left and that became my daily photo selection. 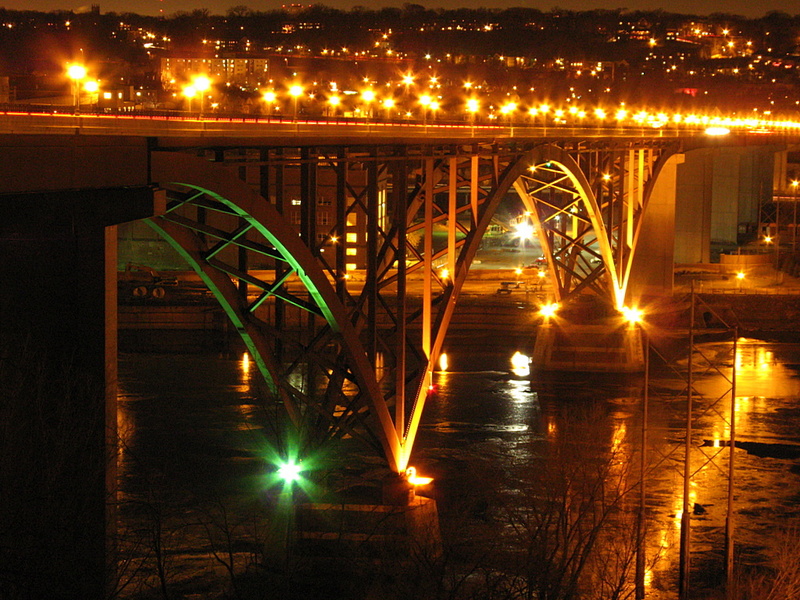 I took this photo of the Wabasha Bridge from the bluff, but didn't use it as a bridge photo because will all of the scenery, I thought the bridge became lost in all of the city lights. I took this photo from my seats at the last Minnesota Wild hockey game. Our opponent for the evening was the Vancouver Canucks. It's my favorite rivalry to watch and every game is a close one. 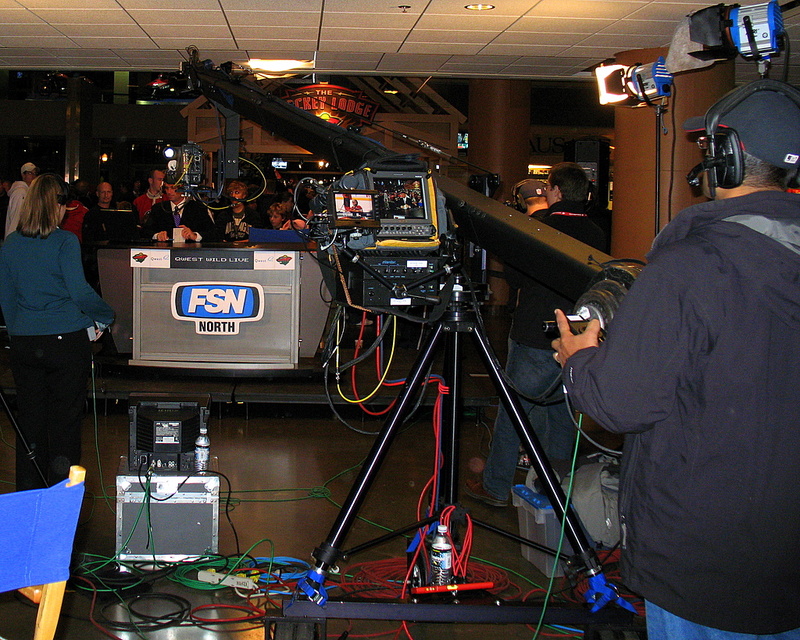 The FSN North sports network has been broadcasting their shows directly behind my seats for the Wild games. It's kind of fun to watch and when the announcers are waiting for the period or the game to end, they like to stand behind my seats to watch the game. I've chatted with them a few times and they all like to kid around and seam eager to talk with you. The announcer you see behind the desk is Anthony LaPanta. It's officially winter here in the Twin Cities. About 6-10 inches of snow fell around here today marking the largest snowfall this early in December since 1991, during our famous Halloween storm. Those of us who were here remember the 30 inches of snow that fell and the havoc it caused for days.